Today was the official start of the school year in Papillion. The girls were awake getting dressed when I went into their rooms to wake them at 7. They both seemed eager to start the new year. Our morning went smoothly as our routine in the summer is the same as the school year (wake up, get dressed, do hair and brush teeth, THEN come downstairs and take as long as you want eating breakfast). Asher was not happy from the start, perhaps a little sad that today the girls would be gone for at least the morning. We walked up to school to a full line up of kids. Addison quickly found her friend Kaitlyn who was arriving at the same time. We snapped a couple pictures and the girls found their way into their class line ups. Addison nor Alivia wanted or needed me to walk them in. Addison help Kaitlyn's hand as they walked into school. It was cute and I am happy they have each other. Alivia got into line with her friend Gabby behind her (who is not in her class, unfortunately.). They were off...to the first grade and the third grade! And, then it was just me and Asher, walking away hand in hand. Asher thought it was fun to walk up to school because, "All my friends are here!" as he saw his friends Henry, Cameron and Keagon! I may have held his hand a little tighter as we walked away. I realize this is my last year with my little boy, so I need to not take these moments for granted. I also missed Chris as I saw mostly parents, Mom's and Dad's together, sending their kids off. I guess I am thankful I have Chris, even if in spirit, and that he has a job (Thank you Mom for reminding me!). Asher and I walked home, then took a slow, quiet walk with Pippa. Asher was chatty, talking about how we used to see our friends Evan and Stacie on our morning walks after school. We miss them (and so does Alivia who asked after school why again did her friend Sydney have to move away?). Asher and I kept busy at home, running a couple errands, before it was already time to pick up the girls at 11:40. They briefly told me about their day. Addison liked her new teacher, but she missed her Kindergarten teacher. She liked being in class with her friend Kaitlyn, but she missed her friend, Kate. She looked forward to their little show and tell project tomorrow and having lunch at school with her friends. Alivia really did not say much. She told me that she talked with her friend Emma at recess. Is she too old to play? No, that can't be. 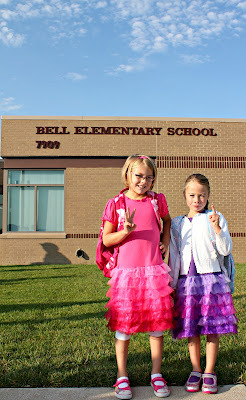 She excitedly reported that she will be the big older buddy to a Kindergartener this year. She was really excited about that. Alivia was happy to finally be in class with her friend Emma, but she was disappointed to not be in class with Gabby. Alivia is really laid back, however, and is used to her friends not being in class. She also knows that I will host a play date to whomever she wants to have over that she does not get to see enough during school. She thought her new teacher was nice. Alivia is a girl of few words. We celebrated the first day down by having a picnic (of McD's Happy Meals no less) at Halleck park with our friends Krissa, Kaitlyn and Will. The kids played an hour and a half or so before they were ready to go home. One day behind us, many more to come. Here is to a great school year; we are off to an awesome start! Sounds like a wonderful first day! I hope the rest go by as well! :) Love your first day photos and memories! Girls Day Out to Mahoney!